Nendoroid Petite x Mini 4WD Racing Miku 2012 version drives Astute Special was available for pre-order about the same time as Nendoroid Sakura Miku. A dream collaboration between Nendoroid Petite and Mini 4WD! Tamiya’s Mini 4WD model car series has just celebrated its 30th anniversary and is now working in collaboration with the Nendoroid Petite series to create a joint product that will be produced by Dengeki Hobby Magazine! The first in the series is the Hatsune Miku GT Project’s mascot character, Racing Miku! Using specially developed parts, the Nendoroid Petite figures can easily jump into the Mini 4WD models and drive around! Each car is specially designed to suit the image and colors of the character that the car is designed for, and the figure mount is actually a cleverly designed battery holder! A set of stickers is also included with the Mini 4WD to customize it your way! Connectable model assembly kit (no glue required). 150mm long / 97mm wide / 44mm high. 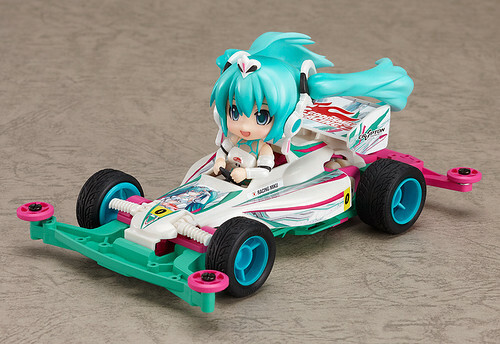 Nendoroid Petite x Mini 4WD Racing Miku 2012 version drives Astute Special will be released on January 2013, priced at 2100 Yen. This entry was posted in News and tagged hatsune miku, nendoroid, petite, puchi, racing miku, tamiya.